Treasury Secretary Tim Geithner identified problems with Libor rate setting process when he was head of New York Fed in '08. NEW YORK (CNNMoney) -- Documents released Friday show a Barclays official admitted to the New York Federal Reserve in April 2008 that the bank was under-reporting interest rates used to calculate the key Libor rate. But the Barclays official who made the admission said the under-reporting was done in order to allay concerns about any weakness at the bank. He did not disclose that it was done, as has been revealed in recent weeks, in order to unfairly profit in derivatives trading. The problems with the process 18 major banks use to set Libor -- a benchmark rate set in London that's used to determine trillions of dollars of loans worldwide -- have come into focus in the past two weeks. Barclays (BCS), the U.K.'s No. 2 bank, admitted that its employees regularly manipulated Libor between 2007 and 2009, and that it was done at the request of traders at the bank and other banks. Barclays agreed to pay $453 million to U.S. and U.K. regulators. But while the New York Fed officials were investigating the misreporting of the Libor rates at Barclays and elsewhere, it was not looking at derivative trading as the incentive. "The Barclays employee did not state that his bank had been involved in manipulating the rate for its own trading advantage," the New York Fed said in its release of documents involving Barclays and Libor. The document release came at the request of Rep. Randy Neugebauer, a Texas Republican who chairs the House Financial Services Oversight subcommittee. He asked for transcripts between Fed officials and Barclays dating from August 2007 through November 2009. The Fed said there were concerns about the Libor rates being too low as early as early as August 2007. In the transcript of a call on Dec. 17, 2007 -- a week after a Fed rate cut -- between unidentified Barclays and New York Fed officials, the Barclays official says generally "Libor's being set too low anyway." But there was no specific admission of Barclays doing anything wrong in that call. The Fed released a transcript of a call between New York Fed analyst Fabiola Ravazzolo and an unidentified executive at Barclays from April 11, 2008, in which the Barclays official admitted it wasn't honestly reporting its real borrowing cost. But he said it was being done to avoid making the the bank appear weak, less than a month after the collapse of investment bank Bear Stearns, and discourage market gossip that would cause its share price to go down, rather than to try to come out on top in trading. "We know that we're not posting um, an honest Libor," he told Fabiola. "And yet we are doing it, because if we didn't do it, it draws unwanted attention on ourselves." The Barclays official also offered his opinion that other banks were also under-reporting their Libor submissions. Treasury Secretary Tim Geithner was the president of the New York Fed at that time, and he became involved in the bank's investigation into Libor. On May 1, 2008, he raised the subject at a meeting of the President's Working Group on Financial Markets, a body that comprised the heads of all the various U.S. financial regulatory agencies, chaired by Treasury. New York Fed officials also gave a more detailed briefing to Treasury officials on May 6. Related: Libor tinkering was no secret on Wall St. 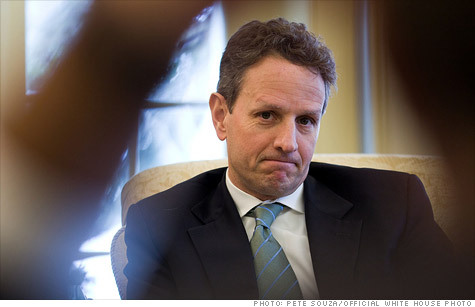 In the e-mail Geithner made suggestions to reduce the incentive of banks to misreport the interest rate at which they borrowed from other banks, reducing the risk they would try to manipulate the market. The memo, sent to Mervyn King, the governor of the Bank of England, does not specifically charge that banks were gaming the system in order to make money, as has since been revealed. But it said there needed to be improvements in the integrity and transparency of the rate-setting process. King's response to Geithner said the Bank of England would ask the British Bankers Association, which oversees the Libor collection process, to include Geithner's suggestions in its consultation document that it gives to the major banks. The New York Fed, which oversees many of the major U.S. and foreign banks with operations on Wall Street, has already disclosed it asked Barclays about how it submitted its suggested Libor back in 2008. The New York Fed said it had received "occasional anecdotal reports from Barclays of problems with Libor." A spokeswoman for the Treasury Department had no comment on Geithner's memo. Libor is used as a benchmark for an estimated $10 trillion in loans worldwide, including the interest paid by consumers on many variable-rate mortgages and credit cards in the United States. It also is used as the basis for trading in an estimated $350 trillion in derivatives worldwide by major banks, so the manipulations may have cost pension funds and local governments that were trying to protect themselves against changes in interest rates by buying the derivatives. The British Parliament has already held hearings into the Barclays' Libor scandal. But despite the request for documents by Neugebauer's House subcommittee, there have been no hearings held in the United States so far. Rep. Peter Welch, a Vermont Democrat, is circulating a letter among members of Congress calling on Attorney General Eric Holder to "carefully investigate and aggressively prosecute all senior bank officials who participated in manipulating" Libor. But the Justice Department already disclosed in February that it is conducting a criminal investigation into alleged manipulation of Libor. That disclosure came in a filing in a civil class action suit revolving around Libor manipulation. -- CNNMoney reporter James O'Toole and CNN's Deirdre Walsh contributed to this report.